Gout is a type of arthritis that causing inflammation, usually a?ects one joint at a time, often the joint in the big toe, which occurred suddenly. It is caused by deposition crystals of uric acid in the joints. The crystals irritate the tissues in the joints to cause inflammation, swelling and pain. However, in severe gout, many other joints can also be affected. This is known as polyarticular gout. The pain is likely to be most severe within the first 12 to 24 hours after it begins. Triggers for attacks include surgery, dehydration, drinking sweetened with sugar or high-fructose syrup, alcohol, red meat and seafood. Chronic gout treated with medications that can lower the levels of uric acid in the body. 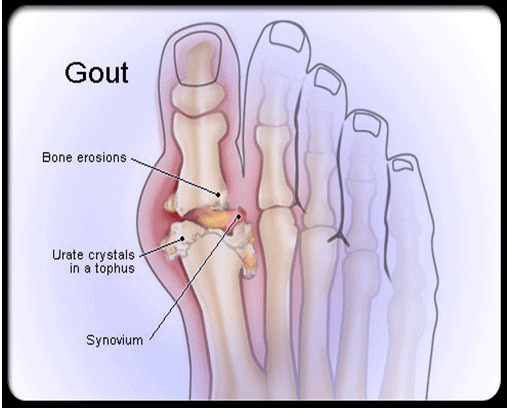 If left untreated, gout can cause irreversible damage with kidney problems and deposition of uric acid in tissues. Men are more likely to get affected than women, but women become increasingly susceptible to gout after menopause. When gout pain experienced is mild, infrequent and not serious, it can be treated with diet and lifestyle changes. However, when the attacks became frequent, the uric acid level is very high, the production of kidney stones, the formation of tophi or there is evidence of joint damage, the treatment usually involves medications. Selected remedy will be based on current health and the severity of gout. Gout medications can be used to treat acute attacks, lower the uric acid levels in the blood, prophylactic medications are used to reduce the risk of recurrent attacks in the first six months of treatment and medication to reduce the risk of complications from gout, such as the development of tophi (small lumps forming under the skin) from urate crystal deposits. NSAIDs may control inflammation and pain in the affected joint. Doctor may prescribe a higher dose to stop an acute attack, followed by a lower daily dose to prevent recurrent attacks in the future. . It can relieve a gout attack quickly (within 12-24 hours). However, NSAIDs are used only in a short period only. If you’re unable to take NSAIDs, your doctor may recommend colchicine, a drug that is effective in reducing gout pain especially when given during an acute attack. Doctor may prescribe a lower daily dose of colchicine to prevent recurrent attacks in the future. Corticosteroid such as prednisone may control gout inflammation and pain. Corticosteroids are generally reserved for people who cannot take either NSAIDs or colchicine. Patients who have had two or more attacks of gout within a year. There is one or more kidney stones are formed from uric acid. Medications that can improves uric acid removal such as probenecid. Normally, this drug is particularly appropriate when allopurinol is poorly tolerated. It enhances the ability of the kidney to remove uric acid from the body. This may lower uric acid levels and reduce the risk of gout, but the level of uric acid in the urine may be increased. To reduce the risk of serious side effects, doctor will try to find the lowest dose that controls symptoms of gout and giving steroids for the shortest possible time. Please inform and discuss with your doctor or pharmacist if you are experience any side effects of the medications so that the appropriate treatment may be given to control the illness. Ensure high fluid intake. Take at least 8 to 16 glasses (about 2 to 4 liters) of fluid per day. Limit the amount of sugar-sweetened soft drinks/carbonated. Limit or avoid alcohol consumption. Drinking too much alcohol can cause uric acid to build up. Eat a balanced diet with preferred fruits, vegetables, whole grains and low-fat foods. Get protein diet from low-fat dairy products. Avoid diets with a high protein intake and foods rich in purines, such as liver and seafood. Regular exercise and smoking cessation should be encouraged. Maintain a desirable body weight. Losing weight may reduce uric acid levels in the body.